When Shura disappears, Mephisto sends Yukio and Rin to find her, telling them to go to Aomori Prefecture, as that is where she is from. Plus the most recent GPS reading places here there. Yukio claims he can handle the assignment alone, to Rin’s dismay, but Mephisto insists they work together, so off they go. He also lets Yuki know that he knows about his dangerous training, and to be careful. They take a train to Lake Towada and find room in an inn. The old lady who runs the inn assures them they’ll have privacy, having totally misinterpreted their relationship. As they relax in a hot bath, Rin questions Yukio about the dangerous training, which his brother blows off, then reveals how he has messed up with Shiemi. He asks Yuki if he likes Shiemi too, but doesn’t really get an answer to his question. Later, in speaking with the innkeeper, they learn that Shura spent the night there and said when she left that she was sort of going home. This volume is primarily about Shura, but it’s also about Yukio and Rin, giving them some brotherly alone time which they seldom get. Shura’s backstory is interesting, and the contract she was burdened with horrendous. Finally resigned to her fate, it takes the two brothers to make her see she can have a life of her own. I love the flashbacks of when she met Father Fujimoto. The things she said and did made me laugh, especially when she said she wanted to have his baby! I loved seeing Rin and Yukio working together. I worry about Yukio, and whatever power is coming to light inside of him. I think he’ll be all right. After all, look at Rin! He’s a good boy, just high spirited. And not likely to be swayed to the dark side. Another great volume, look forward to more! 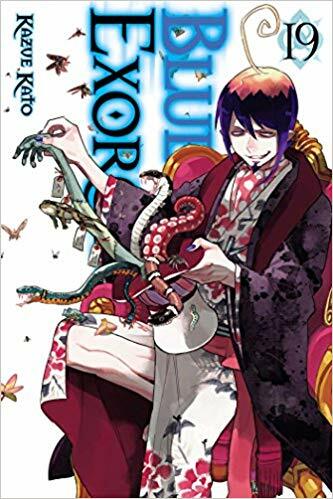 This entry was posted in Reviews and tagged Blue Exorcist, Book review, Julie Lynn Hayes, Kazue Kato, manga, Rin Okumura, son of Satan, Viz Media on January 10, 2019 by wedbriefsfic. Yukio visits Shura in the hospital to discuss the current situation and to explain about Shima being a double agent. A tired, overworked Yukio doesn’t trust either Mephisto or Shima, but for the present there is nothing to be done about that. Shura tells him that Mephisto has given her tickets for everyone to an ultra bath in Southern Cross, and tells a reluctant Yukio he needs it as much or more than anyone else. So everyone heads out for some down time, including the acknowledged spy in their midst. The girls share some time in the bath, while the boys goof around in their bath. When Shima shows up, they think he’s acting weird, until he reveals the reason for his behavior – namely, that Izumo, Shiemi, and Shura are right next door, and they are naked! His stated intentions of seeing them naked produces an unexpected declaration from Rin. Back at home, Rin finds an abandoned kotatsu with a missing blanket, and dreams of being able to have people over for a hot pot party! Concerned about his brother, he questions Yukio, who blows him off, as always. At the Vatican, Mephisto is attending a meeting at True Cross Headquarters concerning recent develops. The name Igor Niehaus is brought up, the former instructor who was suspended after an attack on Rin and whose current whereabouts are unknown. Accused by Arthur Angel of being a traitor, Mephisto convinces them that he has their best interests at heart, and is working to keep the Gehenna gate closed. Lightning privately convinces Angel to have him assigned to the Japan Branch of True Cross, so he can look into matters. To the Exwires dismay, Yukio informs them that they will be taking exorcist certification exam sooner than expected. They must each resubmit their desired meisters ahead of time. Rin discusses the Yukio situation with Shiemi, but she is as much in the dark concerning his behavior as Rin is. Meanwhile, Yukio has his own agenda, one that brings him little sleep, brought on by unexpected observations of himself. Lightning shows up at True Cross as an instructor, and takes Suguro on as his acolyte/servant. The other Exwires can’t believe the highly alpha Suguro acting like such a toady, but Suguro insists Lightning is his mentor and he wishes to learn from him. He hopes that if he does well, Lightning will take him on as an apprentice. Shiemi is uncertain which meister she wishes to study for, so returns home to consult with her mother, only to have an unexpected discussion. On a routine mission, Shiemi and RIn find themselves trapped together, and things are …. well, said… that could have interesting consequences. The action doesn’t stop in this volume of Blue Exorcist. Never a dull moment. It’s interesting to watch Shima’s return to the school and see how the Exwires relate to him, especially Suguro and Konekomaru. Being a double agent must be tricky. How can either side fully trust him, not knowing for sure where his true loyalties lie since he has to be convincing to all of them? We see more into what Yukio is up to, and his doubts about himself as well as the potentially harmful way he is dealing with it. Sooner or later, I think he needs to tell Rin what’s going on, and Mephisto too. Despite being odd, I suspect there is more good than bad in Mephisto. A love triangle is forming, but I think it’s based on erroneous information and is more a comedy of errors than anything else. Can’t wait to see what happens. 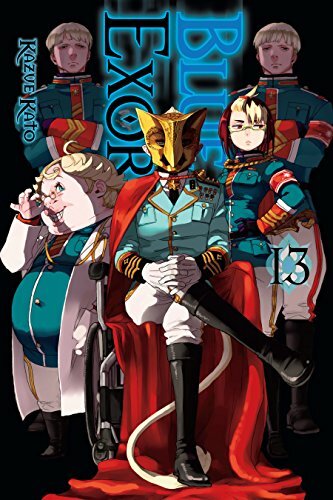 Another great volume, looking forward to more! 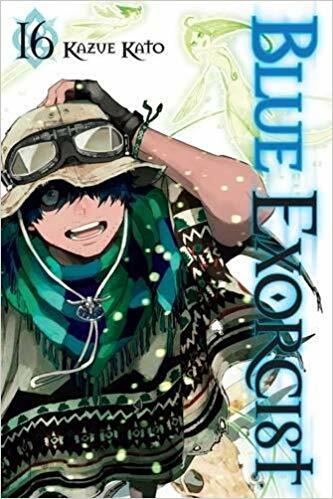 This entry was posted in Reviews and tagged Blue Exorcist, Book review, Julie Lynn Hayes, Kazue Kato, manga, Rin Okumura, Viz Media on January 6, 2019 by wedbriefsfic. The Exwires manage to shrink a monstrous Gedoin down to a more manageable size and find themselves face to face with Shima, who manages to give them the slip yet again. Recovering in the hospital, Izumo learns the whereabouts of her missing sister and uses a key to go see her. She finds that her sister has been adopted into a nice family and is very happy. She doesn’t tell her sister who she is, and her sister doesn’t remember her, so returns to the hospital, crushed. She confronts Shiemi, who only wants to make her feel better, but Izumo isn’t ready for that and resists. Suguro goes home to tell Shima’s family the awful truth about their son, only to learn something very unexpected. In the meantime, Gedoin has escaped and made his way back to Lucifer on the Dominus Liminis. Gedoin only wishes to please Lucifer, but Lucifer thinks he is nothing and quickly deflates him. The Exwires return to school, and we learn more about what Shima is really up to. Naturally, Mephisto is involved. In the classroom, confusion ensues when first one and then a second Shima turn up. Who is the real one and who the imposter? And why is either one there? Mephisto arrives in the nick of time and transports some of the students back to his office before they harm Shima. There they meet Lightning, Arthur Angel’s second-in-command, who has come to determine if Shima is trustworthy. Other questions arise, such as why is Mephisto raising the son of Satan? Answers are demanded. 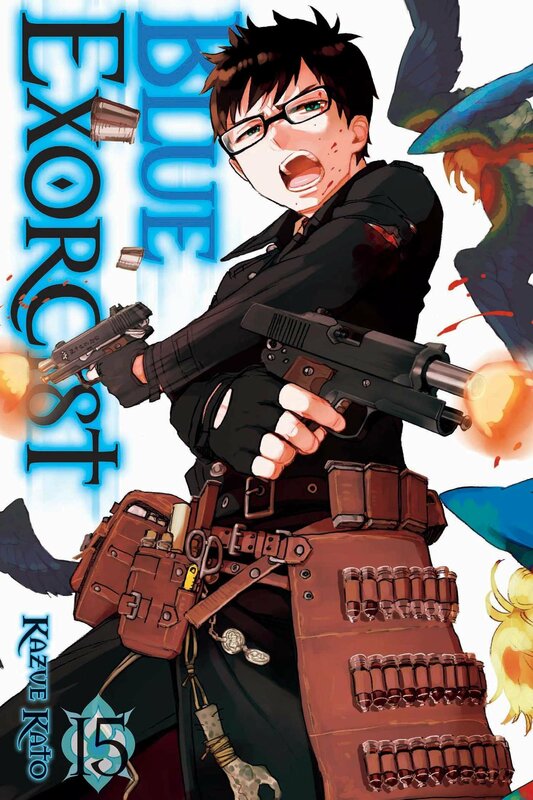 This volume of Blue Exorcist is filled with a lot, both in terms of action and character development and story. The truth about Shima was unexpected, and I can see it becoming problematic for everyone. I love how outspoken Rin is. When asked if he thought Shima was trustworthy, he said no, but he meant Mephisto, not Shima. Plans are being made to fight the Illuminati, and time is of the essence. How much does Mephisto know that he isn’t telling? Also, what’s up with Yukio? An interesting scene hints at what I’ve been thinking all along. Great volume, looking forward to more! 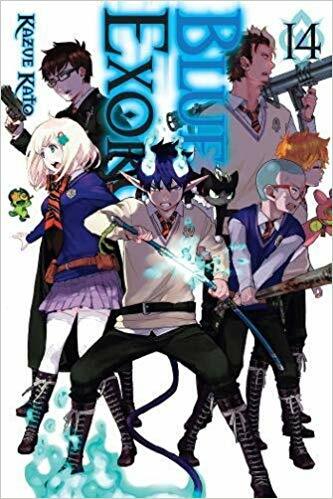 This entry was posted in Reviews and tagged Blue Exorcist, Book review, Kazue Kato, manga, Rin Okumura, son of Satan, Viz Media on January 5, 2019 by wedbriefsfic. The exwires have been sent to rescue Izumo Kamiki from the Illuminati. Unknown to them, the Illuminati also hold Izumo’s mother, Tamamo, using her as a vessel for the Nine Tails. They intend to substitute Izumo for the dying Tamamo. A symphathetic member of the Illuminati tries to help Izumo escape their clutches, but is caught by Michael Gedoin, one of the researchers. He orders Izumo to be taken back to the lab. A distraught Izumo realizes she can rely on no one – especially the traitorous Shima. The exwires head to Dream Town Inari, where they figure out that those people who eat the local food fall under the sway of the Illuminati. Lucky for them, they’ve already been fed the antidote, thanks to Shiemi! Yukio calls for back-up from Mephisto, but as usual, it isn’t forthcoming. Finding what they believe to be the secret entrance to the laboratory, the exwires force their way in only to be met by an unexpected foe – zombies! The situation goes from bad to worse as they find themselves separated from one another. 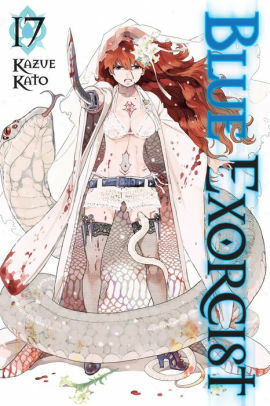 In this volume of Blue Exorcist, the exwires work together in order to rescue their friend, whether she admits to needing their help or not. The villains have a field day as they press on with their terrible agenda. Also in this volume we get our first look at Lucifer – the beautiful man behind the odd mask – and we gain some understanding of why he inspired the devotion he does among his followers. On the other hand, Professor Gedoin is his antithesis – he is utterly obnoxious and repellent, but very devoted to Lucifer. Rin and his friends are growing and maturing as they continue to work together. Things are certainly heating up, looking forward to the next volume! 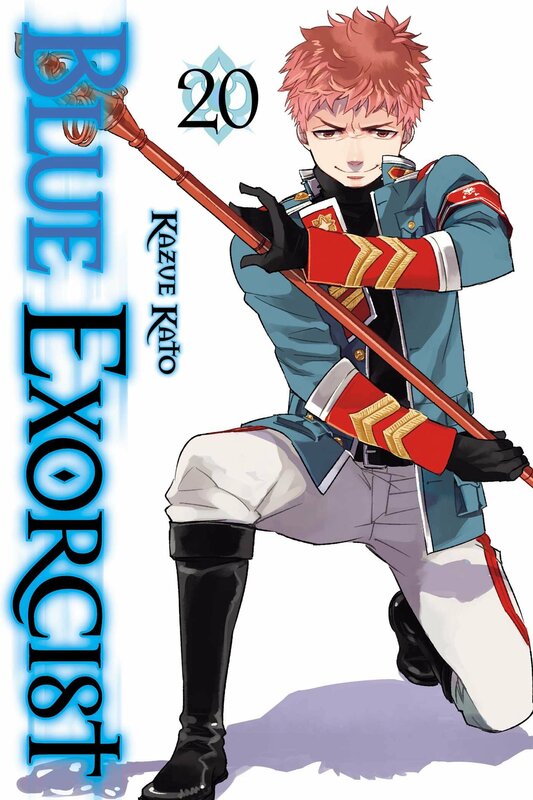 This entry was posted in Reviews and tagged Blue Exorcist, Book review, Julie Lynn Hayes, Kazue Kato, manga, Review, Rin Okumura, Viz Media on December 25, 2018 by wedbriefsfic.